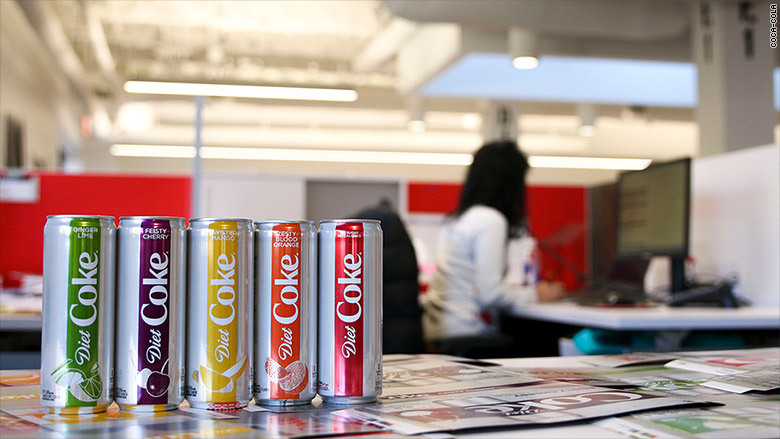 Good news, Millennials: Diet Coke is introducing four new flavors that are sure to tickle your taste buds. At least that's what Coca-Cola (KO) is hoping. 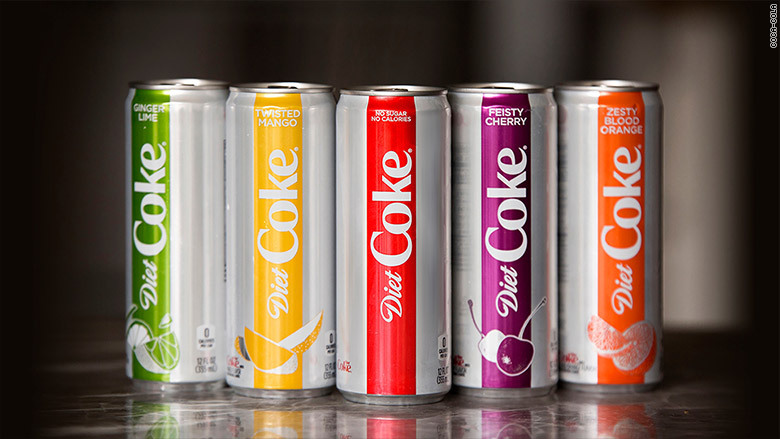 Starting in two weeks, you can buy Diet Coke in Ginger Lime, Feisty Cherry, Zesty Blood Orange and Twisted Mango. They will come in a skinnier silver can, reminiscent of Red Bull's. And the company may have had another drink in mind when it mixed up the flavors -- LaCroix seltzer, which has attracted exactly the audience Coke is after. Coke wasn't shy about which customers it's targeting. "Millennials are now thirstier than ever for adventures and new experiences, and we want to be right by their side," said Rafael Acevedo, the group director for Diet Coke in North America. "We're making the brand more relatable and more authentic." Another Diet Coke executive said the company cast a "broad flavor net" after examining what Millennials are eating and drinking, and tested everything from spicy notes to exotic fruits. Coca-Cola spent two years on the relaunch and says it asked more than 10,000 people for their thoughts. The company is not changing the classic Diet Coke formula, which will still be available in the traditional, squatter 12-ounce cans. Coke has been paying special attention to its low- and zero-calorie drinks. Over the summer, the company replaced Coke Zero with a drink called Coca-Cola Zero Sugar. It paid off: Last quarter, the company reported earnings and sales that topped forecasts, thanks in part to growth from the new product. But in general, consumer appetite for soda, both regular and diet, is shrinking. People are turning away from the artificial sweeteners used to flavor diet sodas -- including the new Diet Coke flavors. In a note published on Tuesday, the research group Cowen reported that diet soda sales fell 2% in the last three months of 2017. In that period, Diet Coke sales fell by 4% and Diet Pepsi (PEP) by 8%. Other sodas have tried this strategy: Pepsi sought to appeal to younger drinkers last year with a disastrous ad featuring Kendall Jenner offering a soda to a police officer on a protest line. After a backlash, the company apologized and pulled the ad. Companies like Coke might want to focus on sparkling water instead of new diet drinks. Cowen noted that over that same period in 2017, National Beverage Corp., which makes LaCroix, reported that sales improved 43% in the sparkling and still flavored water category.